Quentin Tarantino has shared the first images from his next film The Hateful Eight. 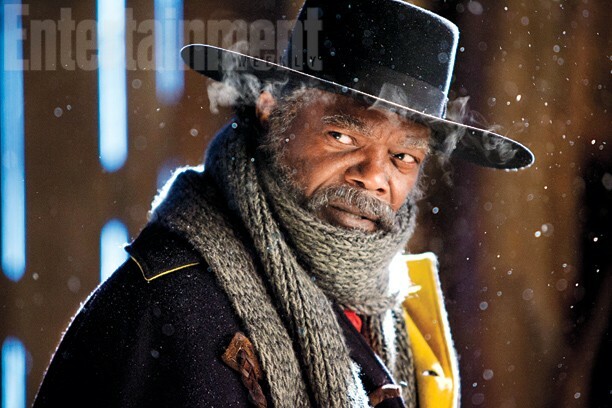 The photos from the upcoming revenge Western, which feature on Entertainment Weekly, show Samuel L Jackson as Major Marquis Warren (The Bounty Hunter), Kurt Russell as John Ruth (The Hangman) and Jennifer Jason Leigh as Daisy Domergue (The Prisoner). Channing Tatum, Tim Roth and Bruce Dern will also appear in The Hateful Eight, which follows a group of post-Civil War bounty hunters seeking shelter during a blizzard. The film is back on track after writer-director Quentin initially cancelled the project, when the first draft of its script was leaked on the internet. He had only shown it to a handful of collaborators, before casting agents called him to start pitching their clients. “The reason it was so bad was because the small group of people involved had to be guilty. And these were people I trusted,” he told the magazine. “Normally when I actually show it to people, I’m done. But this first draft was literally just showing it to just a few friends. There were scenes that I wasn’t even ready to write yet, situations I hadn’t even figured out yet. “That’s why it was so not ready for anybody but just a couple of the inner circle,” Quentin added. The filmmaker behind Django Unchained, Pulp Fiction and Reservoir Dogs admitted he still has no idea who the perpetrator was. “It was interesting because I wrote a mystery but I eventually kind of decided I didn’t want to know who did it,” he explained. The Hateful Eight is scheduled to be released later this year.